Two copies of the popular Disciples and Other Sinners Student Book and one Disciples and Other Sinners Leader's Guide for examination by teachers, Directors of Christian Education, pastors -- anyone interested in an economical preview of this exciting new study. Disciples and Other Sinners by Ronn Kerr is based on the popular new concept in adult study programs -- powerful stories written in first person from the perspective of real New Testament people. In Disciples and Other Sinners, each of the thirteen weekly class sessions evolves around a story by a single character in the life of Jesus. Peter. John the Baptist. Mary Magdalene. Mary, Jesus' Mother. Joseph. Pilate. John of Zebedee. Herod Antipas. Caiaphas. Mary of Bethany. Judas. Nicodemus. Levi. In all, thirteen different Gospel characters are described in these Bible-based stories. Each story is a first-person account by the key character which is Biblically accurate and filled with detail about life in First Century Palestine. Students learn significant details about the individual characters, their motives, and lifestyles, as well as learning how the people lived and worked and worshiped. A primary impact on students is that they come to understand the New Testament figures as real people living in the real world. Test results on this study proved that older youth and adult students truly enjoyed reading and preparing for classroom sessions. And, they felt the format helped them learn much more about Jesus as well as about the many people around him. 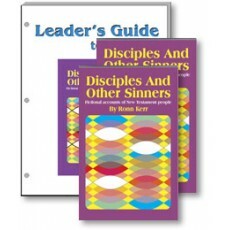 In addition to the stories in the Student Book, the Disciples and Other Sinners course comes with an extensive, loose-leaf, 3-hole punched Leader's Guide with scholarly Biblical background material, leadership suggestions, and creative discussion starters for each story. You can view or print an entire chapter from the link at the bottom of this page. This thirteen-session course is a perfect occasional alternative for dated studies. When the International Lesson Series features a quarter in which there is little interest, substitute Disciples and Other Sinners for a meaningful classroom experience.